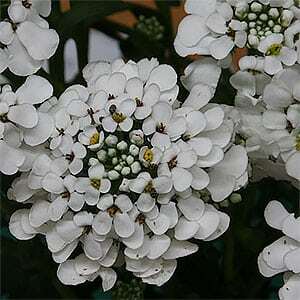 An evergreen perennial with attractive white flowers Iberis sempervirens is commonly called Candytuft. This is a very easy care plant that can be grown beneath taller flowering perennials where it almost acts as a ground cover plant. Plant it in with the spring flowering bulbs and it will cover the area after they die back. Best planted in a drift, dig the soil over well before planting, adding some well rotted compost and cow manure. Plant individual plugs at around 10 – 15 cms apart. Mulch around the individual plants to help retain some moisture. Fertilise by topdressing with a little cow manure in winter, use a regular slow release fertiliser if growing in containers. After flowering it is best to cut the plant right back to grpund level, this keeps the plant tidy and low growing and prevents it from forming wide stems. Easy to propagate from stem cuttings taken from the current years growth in spring to summer. It is also possible to propagate Candytuft from seeds sown directly into the soil in spring to summer, or indeed trays in spring. Soil – Humus rich and slightly alkaline although it os not a really fussy plant. 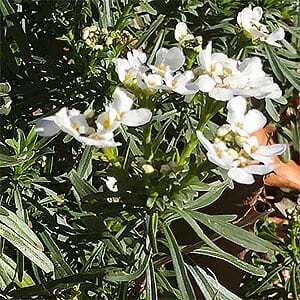 Flowers – Small white terminal flowers. Pink flowering forms are also available.